While plebeian workaday cars can be transported on an open trailer exposed to the elements, high end automobiles have to be cosseted in an enclosed climate-controlled hauler to keep them safe from the prying eyes of Joe Q. Public. In the case of this particular haul, these cars were exposed to much more than wind and sunlight, as the too-tall trailer smashed headlong into a railroad trestle and ripped the top off like a can opener. While the exact contents are withheld, the trailer was hauling a full load of new Bentleys, Maseratis, and Porsches from Florida to Delaware. 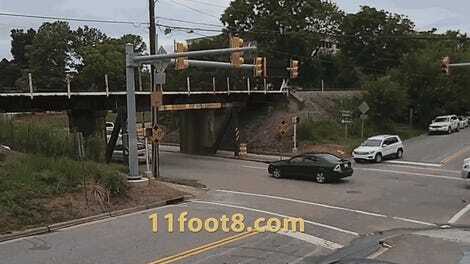 They made it most of the way, only to get crushed by a bridge in Wilmington. According to the police report, several of the cars were seriously damaged. The driver allegedly thought his truck would fit under the overpass, but judged the height of his haul incorrectly. While the tractor made it under the height without issue, the trailer behind was completely annihilated. The roadway was blocked for about 9 hours from Wednesday around rush hour through early Thursday morning. 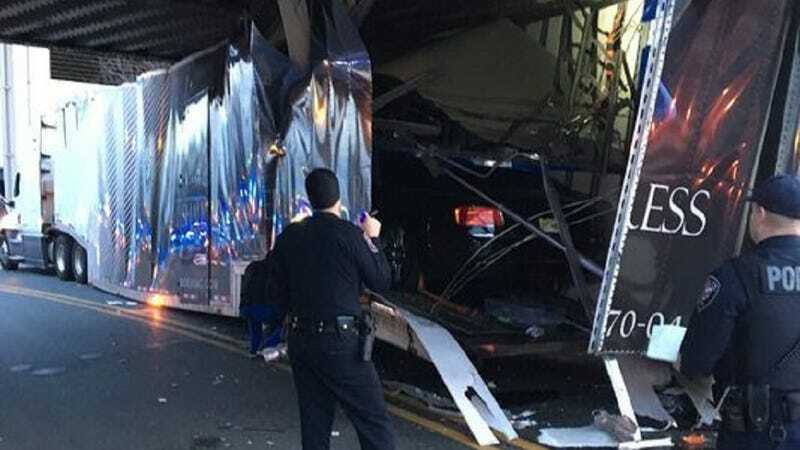 The railroad tracks and the overpass were not damaged in the process, but the truck had to be partially disassembled in order to be dislodged, accounting for the lengthy removal period. The driver was cited for inattentive driving, though we imagine their employer will be a little less understanding.